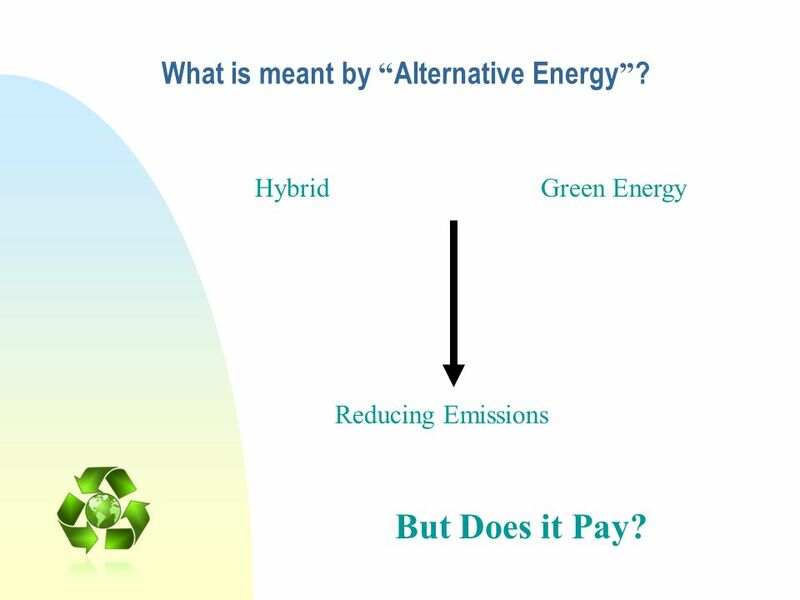 2 What is meant by “Alternative Energy”? 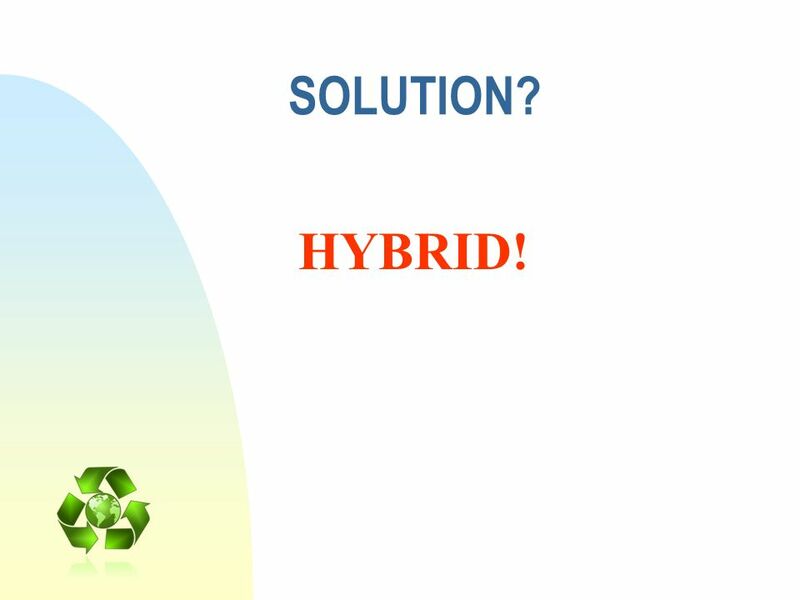 Hybrid Green Energy -So what is meant by Alternative energy? -Every generation seems to have certain catch phrases that stick out. -Certainly these days Hybrid (click) is one of them along with others such as green energy (cliclk) (Click click) These phrases are usually used in on there own or in conjunction but there are almost always used when trying to (click) Reduce Emissions But (click) Does it Pay to do us green energy or alternative energy methods? Shipping industry has always been considered a dirty industry; you just have to go down to the harbor front and you’ll probably see at least one or two ships belching out smoke out of there exhaust pipes As an industry we need to work harder to develop alternatives that help to reduce emissions and provide something better for the future generations as many of our pervious presenters have stated. (Click) Reducing Emissions But Does it Pay? Lead Acid (AGM) Lithium Ion Nominal Voltage 2.0V 3.70V Energy Density 20 Wh/kg 163 Wh/kg Cycle Life (50% DOD) ~3000 (8 yrs.) 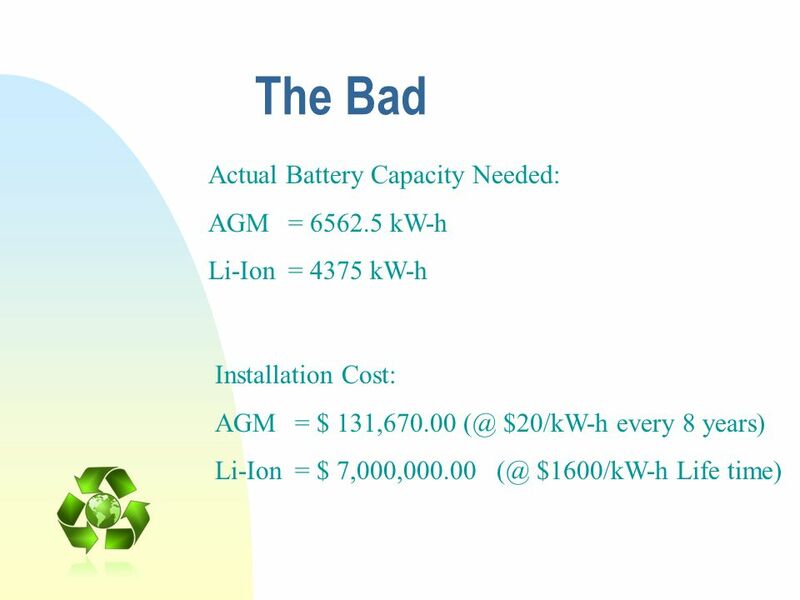 ~300,000 Charge Capacity C/5 2C Pack Maintenance $0/ Life time Installation Cost $20 /kW-h $1600 /kW-h Recyclable Yes -So there is an advantage so let’s look closer at batteries for a minute -For the sake of this study we will compare the standard Lead Acid type AGM with the latest in battery technology, Li-Ion Li-Ion is consider probably the leading technology in batteries today And AGM are the best of the lead acid batteries that are the standard for most commercial applications for the past several years. 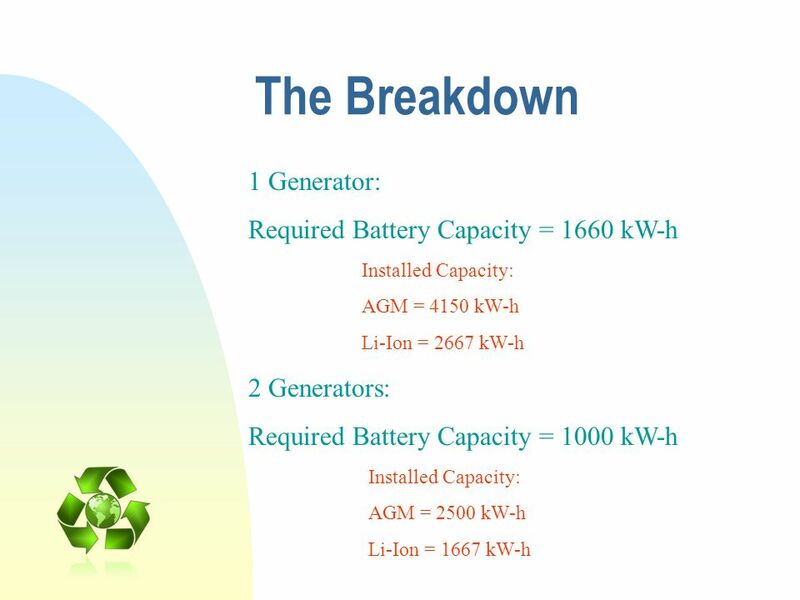 Nominal voltage; higher voltage means less cells required in the bank bank Energy density as we saw in the last slide Cycle life; No battery likes to be discharged completely. This reduces the life of the battery considerably. 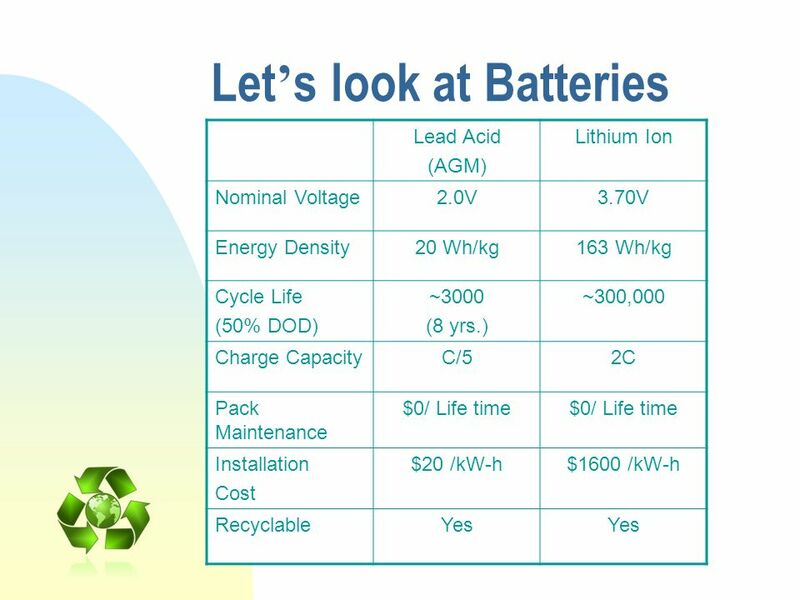 So if we look at the cycle life if we discharge the batteries to 50% their capacity we see the AGM will last approx. 8 years before needing to be replaced while the li-ion will essentially last the life of the ship. I was told by many battery manufacturers that once installed both types of batteries will require zero maintainence over the life of the battery. Now a big one; the cost to install. Ouch the li-ion is very expensive. 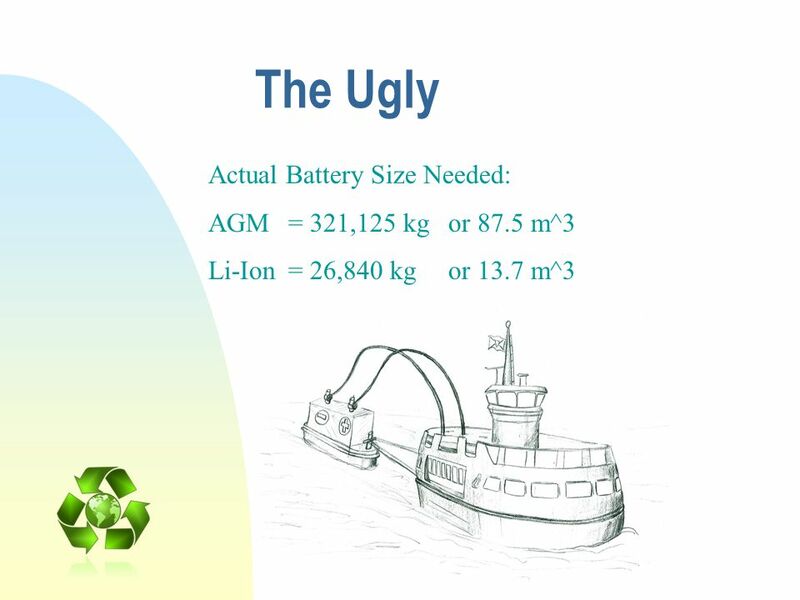 Finally both batteries can be recycled, which is good as it would not make sense to use batteries to help the environment only to fill our landfills with toxic chemicals once they are used. 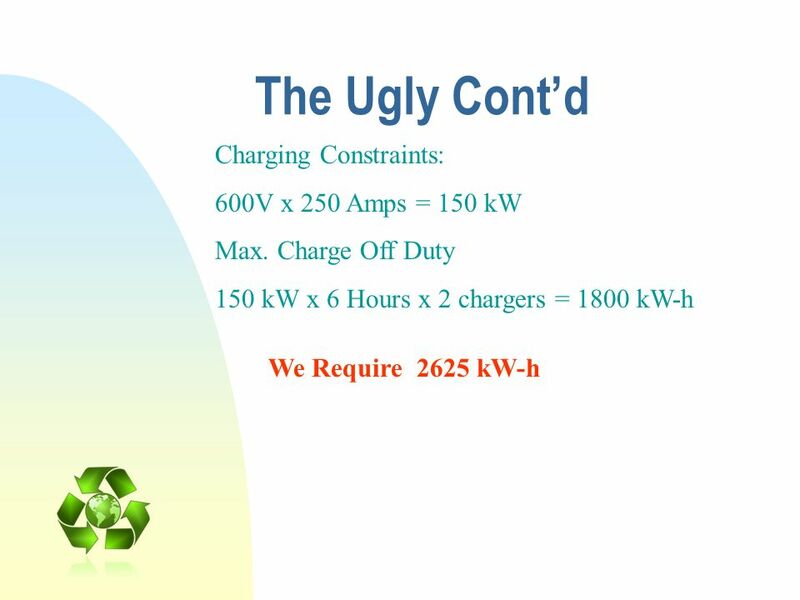 Li-Ion = 4375 kW-h Installation Cost: AGM = $ 131, $20/kW-h every 8 years) Li-Ion = $ 7,000, $1600/kW-h Life time) -As stated before All batteries do not like to be discharged fully all the time. 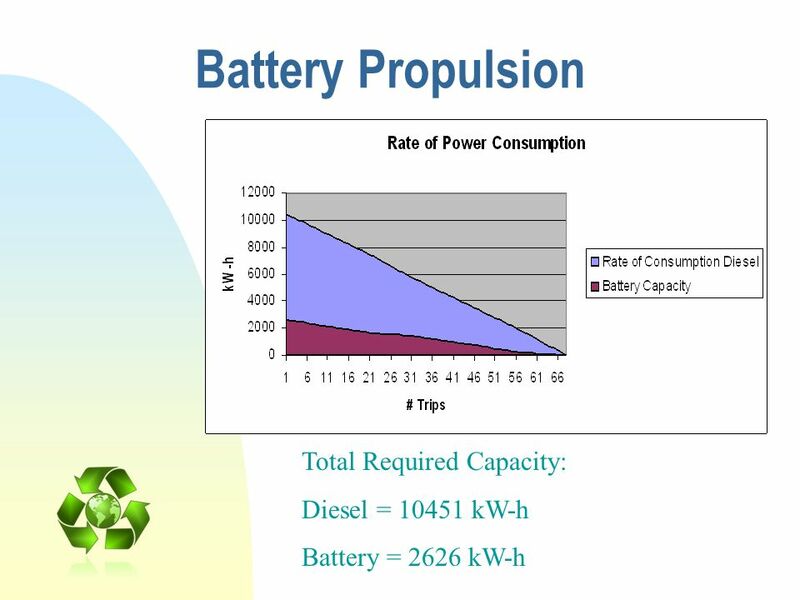 -To get the maximum life out of a battery -AGM’s cannot discharge below 40% of full charge and Li-Ion not below %60. -This adds to the required capacity install onboard and the installation costs. -Yikes, that is a large initial capital cost Then factor in the installation cost and you see especially with the Li-Ion the cost is huge! 11 Over 30 yrs. 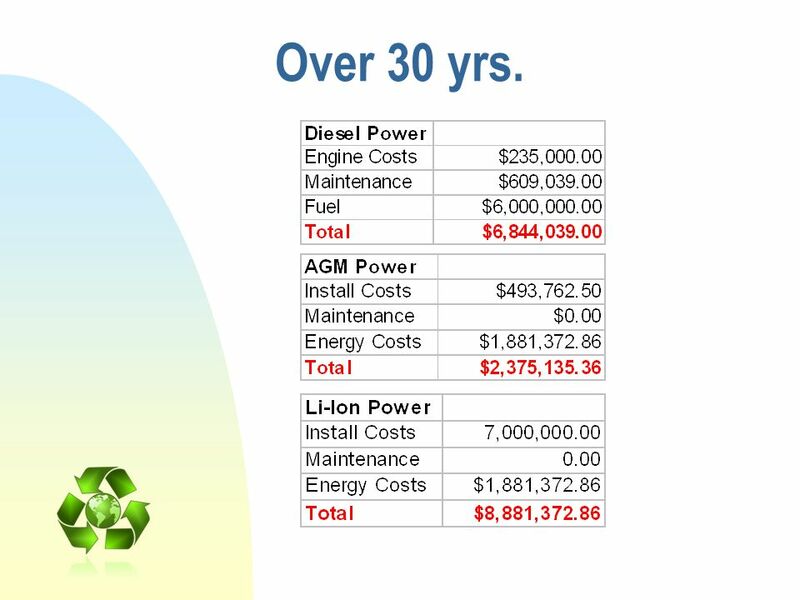 If we look at a very basic 30 yr life cycle cost you can see that AGM’s look pretty good while the Li-Ion battery bank is very expensive relative to diesel power. 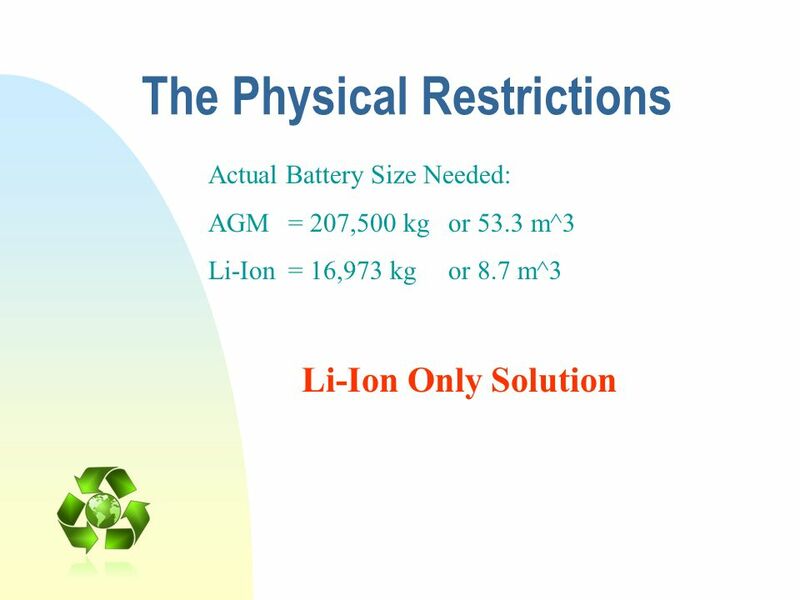 Li-Ion = 26,840 kg	or 13.7 m^3 Now the ugly; Remember the energy density and how much lower the AGM and LI-ion were? 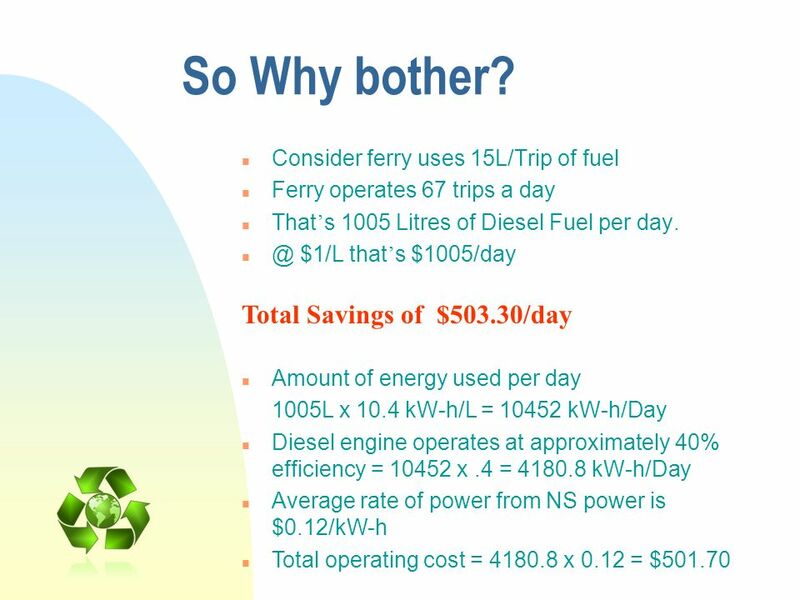 Current ferries have full load displacement of approx. 200 tons. Therefore AGM not sensible solution. 14 Now Where? What are the things we need to change? Need to reduce the Battery Bank Size. Reduce the Battery Bank Capacity. Reduce the installation costs for the battery bank. So now where? 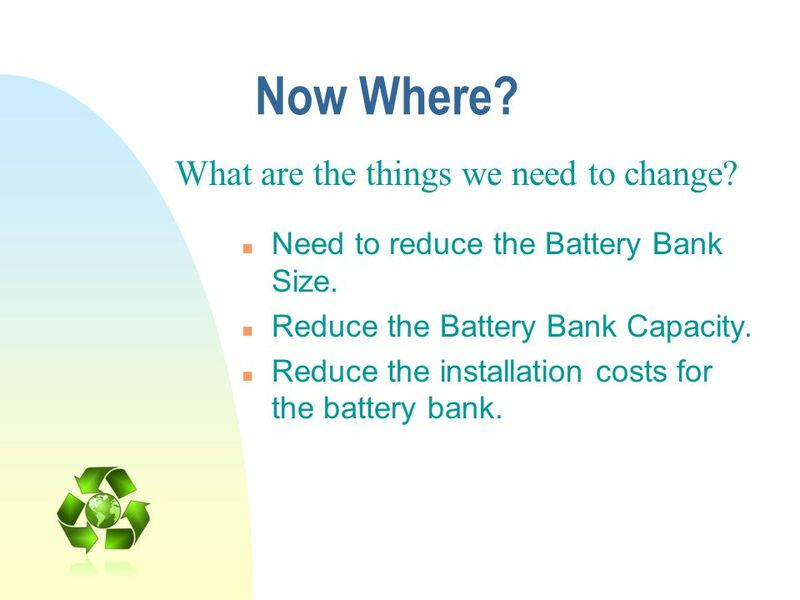 Well, we need to work at reducing the battery bank size We need to work at reducing battery capacity, which in turn reduces the size of the bank We need to reduce the cost to install the battery bank See the trend here? 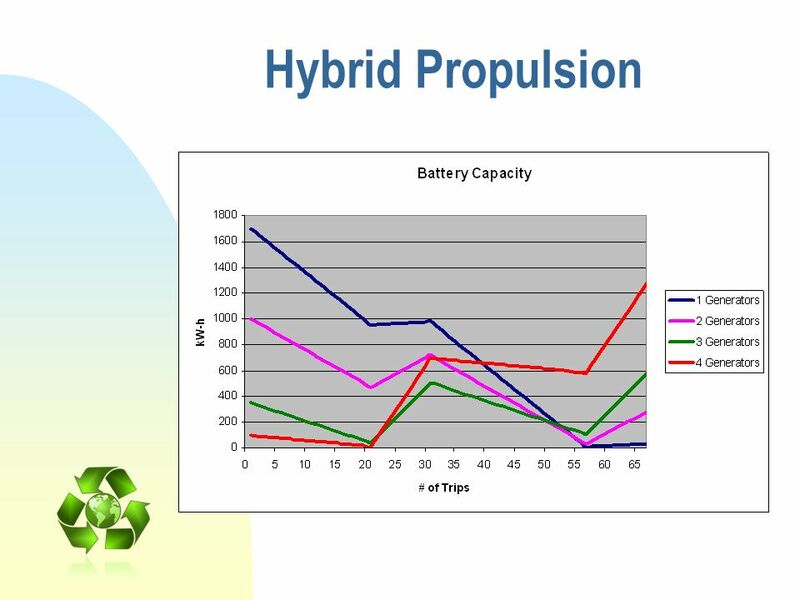 16 Hybrid Propulsion So with a hybrid system we look at installing 1,2,3… generators to help continually charge the battery bank. Hope is to run ferry off batteries and save fuel by only using a smaller generator to help suppliment power. But How many generators do we need?? If we Base on our calculations on a 44W genset, you’ll see why we choose this size of generator later. The more generators we add the smaller the required battery bank gets. Great! But there comes a point when we start to get more generated power than we really need. 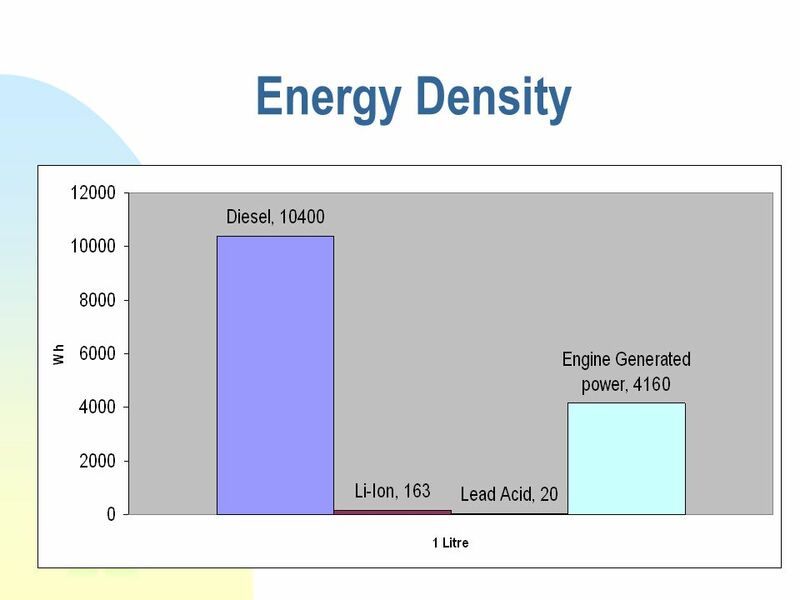 This defeats the purpose of having a battery at all as we are burning diesel fuel to generate this power. In this case the best solutions look like either one or two generators. 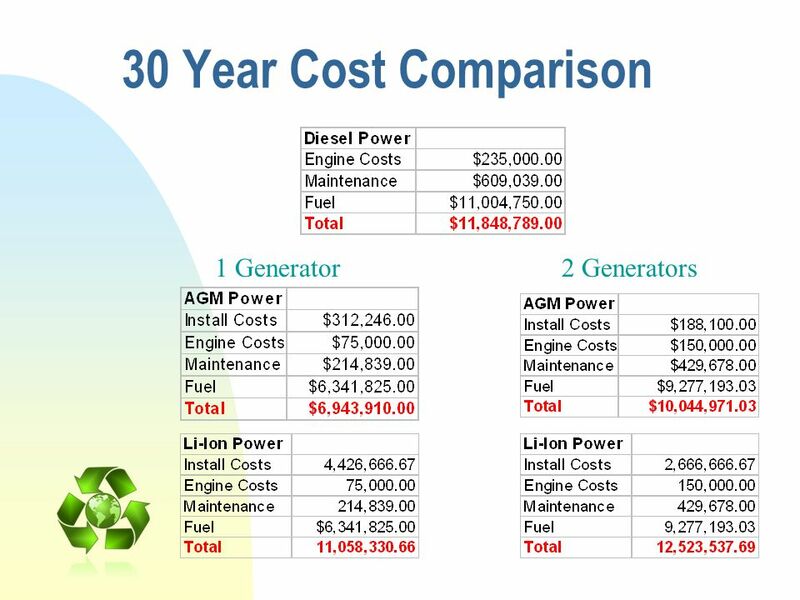 If we look at our basic 30 yr life cycle costsing and Factor in Engine costs, Additional fuel costs, and Maintenance costs We see that there is a slight savings using one generator for both AGM and Li-Ion and with 2 generators just the AGM solution makes sense. Or does it??? 21 From Here? Further analysis required into ferry operating loads. Further study into optimal generator size and quantity. Discuss possible safety issues with regard to stored battery capacity. 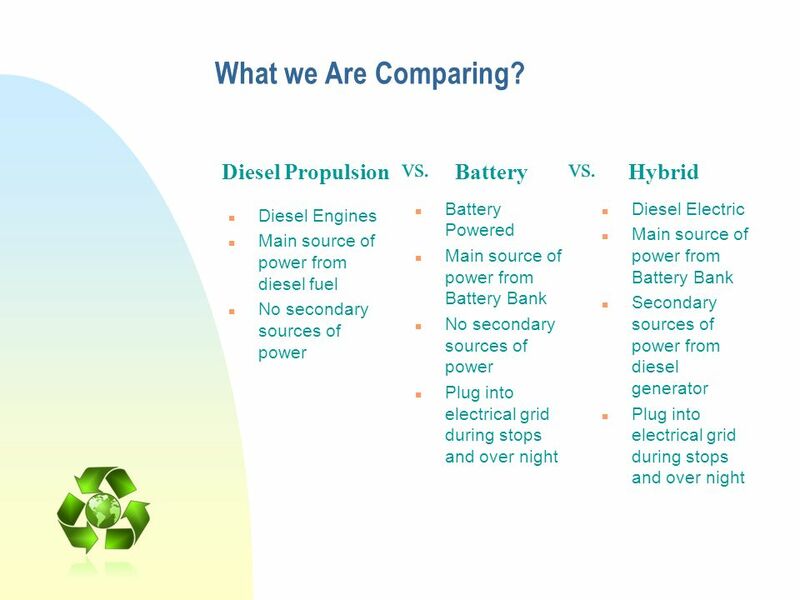 Look for better battery technology to improve energy densities. 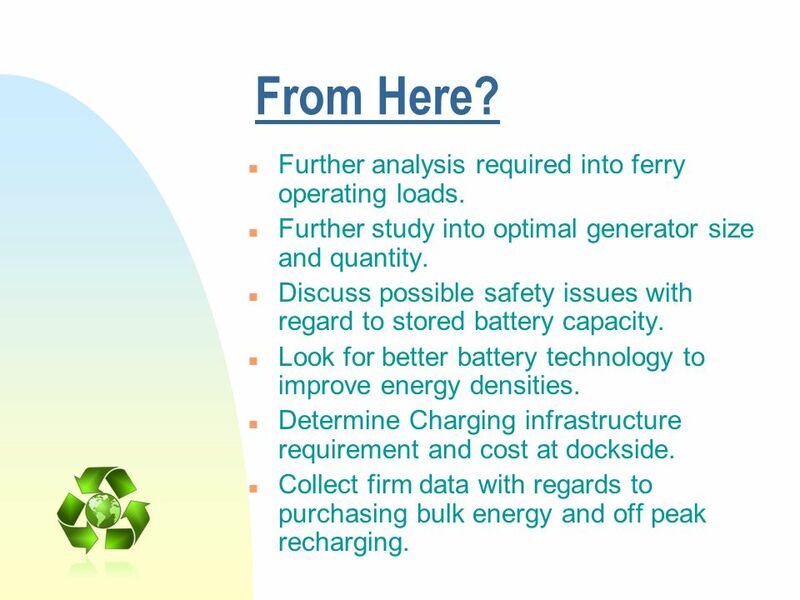 Determine Charging infrastructure requirement and cost at dockside. Collect firm data with regards to purchasing bulk energy and off peak recharging. 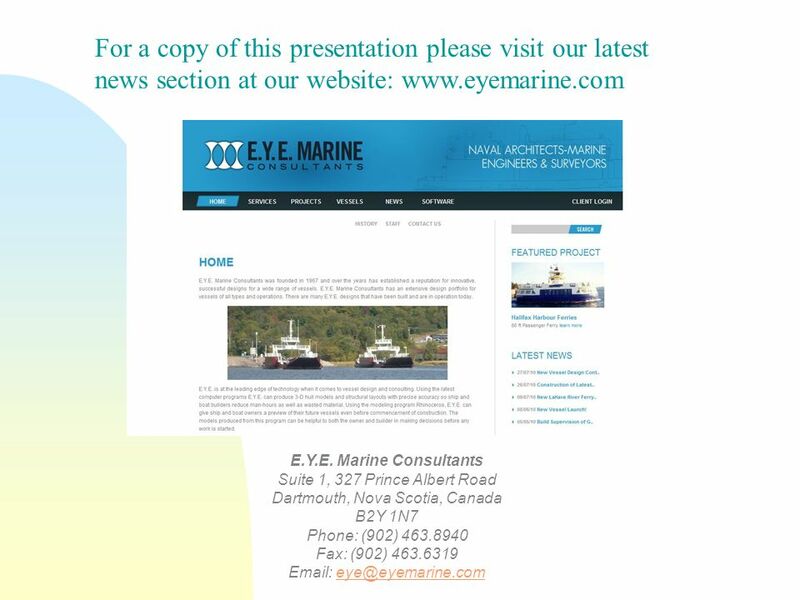 1) Further study into ferry operating load; to further try and reduce battery capacity (for this study we looked at full power loads) 2) Further study into matching generator size and quantity to maximise the battery usage, longevity and recharge cycles 3) Discuss with Transport Canada minimum tolerance with regard to generating power and battery capacity during the operation of the ferry. 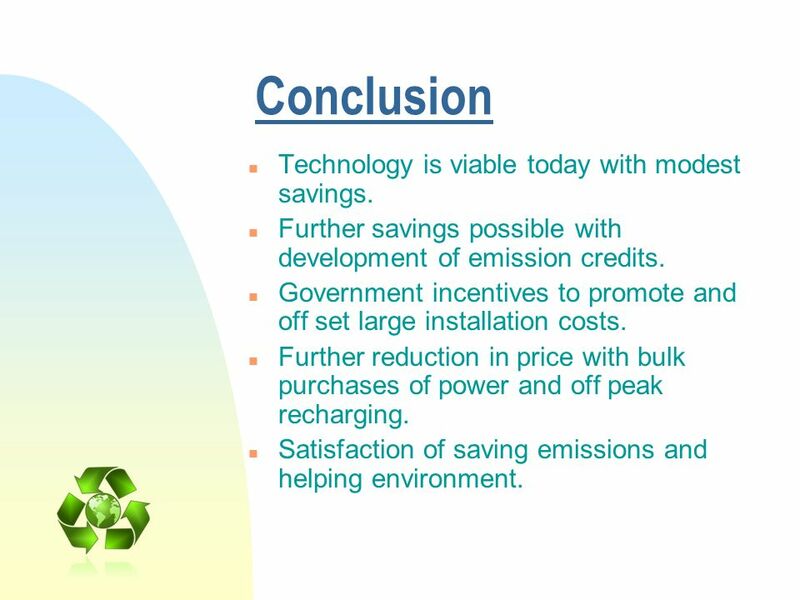 22 Conclusion Technology is viable today with modest savings. Further savings possible with development of emission credits. 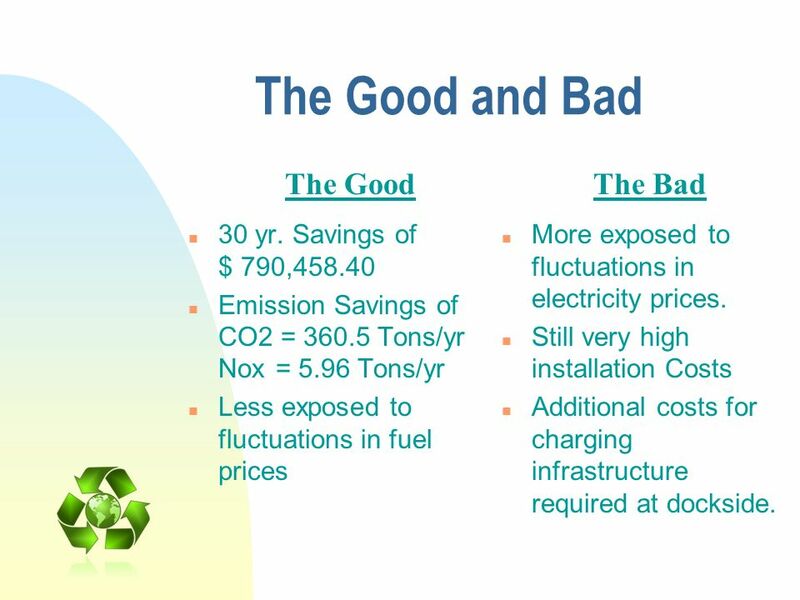 Government incentives to promote and off set large installation costs. 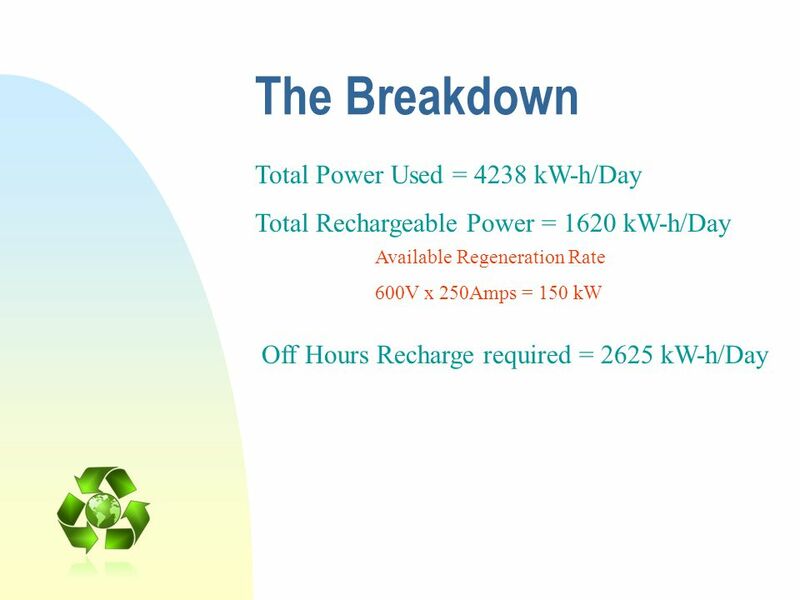 Further reduction in price with bulk purchases of power and off peak recharging. 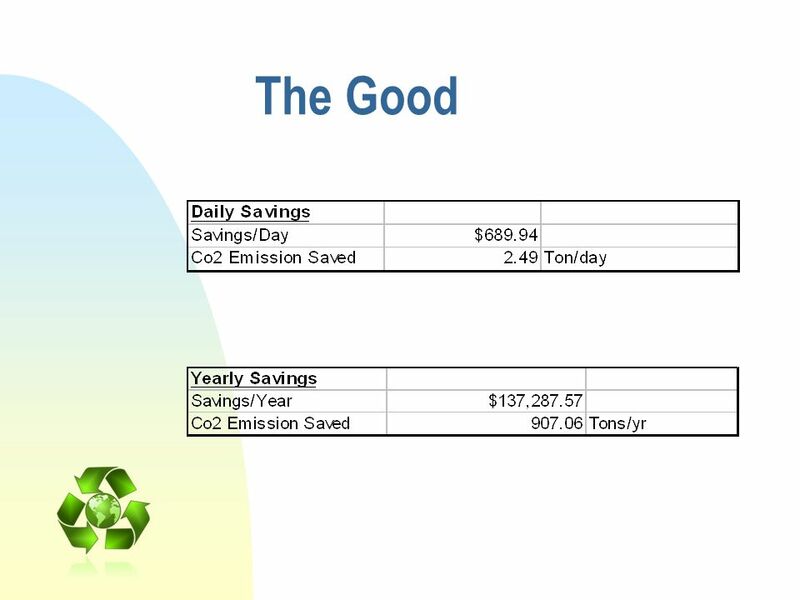 Satisfaction of saving emissions and helping environment. 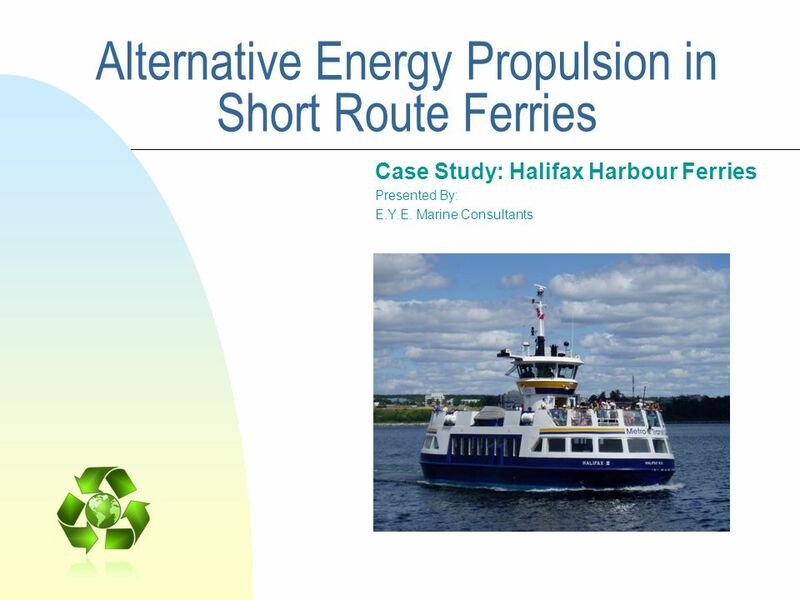 Download ppt "Alternative Energy Propulsion in Short Route Ferries"
Hydro-Québec's Contribution Serge Roy Electricity in Transportation Canadian Utility Fleet Forum May 25, 2009. 1 An Overview of Small Wind Energy Today Shawn Shaw The Cadmus Group, Inc. Sierra Club Northeast Committee Fall Energy Conference 10/12-10/14/2007. Enterprise Document Management Symposium October 5 th – 6 th 2010 Niagara Falls, Canada.